Two cover images for this new mystery. Debut author Bree Baker set up her dandy summer mystery, LIVE AND LET CHAI, with plenty of secrets to explore! Everly Swan's return to her seaside hometown of Charm (off the North Carolina coast, but way more rustic than Hilton Head) looks like a new chapter in her life, which just had a rough patch with a collapsed relationship. 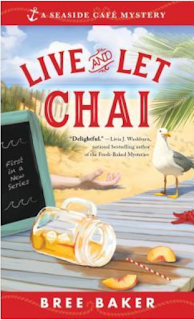 Here she is, though, in her own home at the beach, with enough room to open up the sweet tea and lunch shop she's dreamed of, and her doting aunts (who raised her) close enough to give her a hand; oh, but what's the story on her own parents, and the Swan family curse? Hold that thought. "I'd like a list of anyone else who you believe might have a reason to harm Mr. Paine." "Anyone else? Like, besides me?" I scoffed. "I just told you I couldn't have killed Mr. Paine. It's illogical and mean." "And you're always what?" he asked. "Reasonable and kind?" Eventually, I turned to the notepad and began to recount the events of my evening, logging them as neatly as I could with shaking hands, the memories as vivid and visceral as if I were reliving each awful one. It's soon clear that the only way Everly can retrieve her business, her role in the community, and even her own safety will be to speed up the discovery of the real criminal. Of course, that means interfering in police business a bit. And rubbing some people the wrong way. Sigh. Thank goodness, she'd got supportive friends and family, because things will be tough until the murderer comes to justice. No signs here that Baker, who lives in the Midwest, is a novice -- this is a tightly paced, well put together mystery with just the right balance of suspense and sweet tea. Although it's a an amateur sleuth mystery in the cozy area, the possibility of romance never distracts from the clues and their pursuit, and Everly is a plucky and smart young woman determined to do whatever it takes to put her life back together. Even if that means she'll have to reveal a little of her own past disappointments, not to mention her family's so-called curse -- all of which looks full of material for future books in this "Seaside Café Mystery" series. 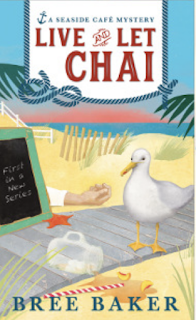 From Sourcebooks, new for July and perfect for the summer reading stack. By the way, the author's already a member of Sisters in Crime, International Thriller Writers, and Romance Writers of America, good confirmation for her own determination and her mystery skills! PS: Looking for more mystery reviews, from cozy to very dark? Browse the Kingdom Books mysteries review blog here.